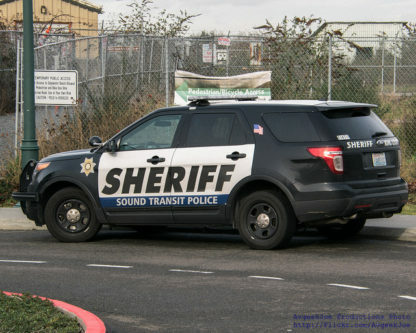 A King County Sheriff transit vehicle. Credit: Joe Kunzler. Fare enforcement is a step removed from policing, and so it can brush against the twin controversies of American policing: racial bias and use of force. In one 2017 incident, rider Devin Glaser saw fare enforcement officers detain two boys of color, whom he estimated to be about 10 years old. Glaser suspected racial bias was the reason for the stop, and the inappropriate behavior of the officers. Glaser reported the incident to Seattle City Councilmember Rob Johnson and King County Councilmember Dave Upthegrove, who both sit on the Sound Transit Board. The board members asked Sound Transit staff to review the incident. Upon entering the train at the Mt. Baker Link Station, the fare enforcement officers (FEOs) in question saw two juvenile riders pop up from their seats and appear to rush towards the doors behind them. Because the riders appeared to do so in reaction to spotting the FEOs, they were identified as potential fare evaders or “hoppers”. Soon after the FEOs boarded the train, the doors began to close and the FEOs, against Sound Transit policy, intentionally blocked the exit so that the suspected fare evaders could not debark. The policy states that suspected fare hoppers should always be followed off of the train and stopped on the platform. After the doors closed, the FEOs checked the youths’ fares and found that they had paid full adult fares. In the course of the investigation, Securitas found no evidence of age or racial bias as was alleged in the original complaint. However, given the policy violations that were found, corrective counseling was issued to both FEOs, and one of the two received remedial training on ST’s policies regarding individuals attempting to elude fare enforcement, policies regarding the handling of juveniles, and the policy regarding the inspection of fare media. The second FEO chose to resign before receiving the training. However, Glaser insists that racial bias was the reason for the incident. Sound Transit has limited demographic data about its ridership, so racial bias in fare stops is difficult to quantify precisely. However, several available data sets do suggest that people of color, particularly African-Americans, are disproportionately cited by fare enforcement. Sound Transit supplied STB with data the agency collects about the self-identified race of each person stopped by FEOs. In 2016 and 2017, a respective 21 and 22 percent of cited fare evaders were African-American riders. In 2015, the year before the University Link extension opened, 25 percent of cited fare evaders were African-Americans. The best racial demographic data available—the 2010 Census—suggests that rate of cited fare enforcement of African-Americans is disproportionate to the share of African-Americans in the general population. So does Sound Transit’s internal data. A fall 2015 Sound Transit study says that Black or African-Americans comprised 13 percent of all riders. 7.9 percent of Seattle’s 2010 population described themselves as African-American in the 2010 Census, and 6.2 percent of King County’s 2010 population described themselves as African-American. In the ZIP codes containing one or more Link stations (98118, 98188, 98144, 98134, 98104, 98101, 98122, 98102, 98105), 14 percent of the sum population identified as African-American in the 2010 Census. Studies of policing confirm that, nationally, African-Americans are disproportionately stopped and ticketed by law enforcement officers. Sound Transit’s director of public safety, Ken Cummins, says that standard fare enforcement procedure should prevent stops based on racial bias. Cummins says that, since officers don’t select which people to stop—pairs start from one end of a train car and systematically check each person on board until they meet in the middle—procedures prevent selection bias. Cummins says that, by statute, fare enforcement officers are designated “enforcement officers,” but are a grade below sworn, commissioned officers like a sheriff’s deputy, state patrol officer, or city police officer. Fare enforcements officers cannot make arrests. They are authorized to use nonlethal force against threatening riders under the direction of commissioned officers, or under their own direction in defense of a fellow officer or a bystander. Since fare enforcement officers are not authorized to use lethal force, FEOs call the King County Sheriff for backup in moments that the FEO believes could become life-threatening to themselves or riders. The Sheriff’s office has faced intense scrutiny for its use of force policy over the last year. In June 2017, King County deputies shot and killed Tommy Le, an unarmed teenager, in Burien. Le’s death prompted County Executive Dow Constantine and other county leaders, at the urging of various Asian and Pacific Islander groups, to revamp the way the county investigates use of force by King County deputies, and restart in-progress inquests of other use of force incidents. King County deputies have shot and killed two people on Sound Transit property in recent years. Both were armed. In July 2018, a deputy shot Jesus Hernandez-Murillo in the Sounder Kent Station parking garage. Hernandez-Murillo had an AR-15 and was driving a stolen Honda Civic; the deputy who shot him said that Hernandez-Murillo was reaching for the assault weapon. The other shooting took place on the platform at the Sodo Link station in July 2014 after a fare enforcement contact. Fare enforcement officers engaged Oscar Perez Giron on a light rail train. When he did not comply with their instructions, the FEOs escorted Giron and another man, Mario Parra Cetina, off the train. A King County deputy arrived a few minutes later. As the FEOs and deputy talked to the two men, Giron attempted to flee. The officers restrained Giron. As they held him, Giron reached into his clothing and pulled out a pistol, which is visible in video of the incident. As Giron pointed the gun at the deputy, the deputy shot Giron. Giron’s death remains the only time that a ST or Metro fare enforcement stop has escalated to the level of discharging a firearm. A September 2018 use of force incident on a Link train at Capitol Hill station is more typical. The incident attracted controversy on the internet, because a video of the incident shows only, without context, officers pinning a rider. However, Cummins says that the use of force is well justified. According to Cummins, the pinned rider had spent about twenty minutes harassing and threatening other riders on the Capitol Hill platform, and ignored repeated descalatory instructions from FEOs and a deputy. Cummins says the man was detained when he tried to flee the scene on the train. This post has been corrected: the April 2018 report was prepared by the King County Auditor, not Metro. 1 Good article, had the same experiences with ST fare enforcement. Like those guys. 2 Folks, without fare enforcement a good chunk of revenue for Transit is gone. Regular commenters know how hard it is to get money into transit, let’s not make it harder to fund the additional service we all want. Folks, without fare enforcement a good chunk of revenue for Transit is gone. The evidence is not clear on that. We still allow transfers, which means it is fairly easy to scam the system. Yet I doubt it represents a very high percentage of the riders. Besides, no one is suggesting that we do away with fare enforcement. It may be cheaper overall to have less fare enforcement, since it is merely the threat of enforcement that causes some to oblige (while the vast majority would pay regardless of how rare enforcement is). Didn’t article 1 of 3 mention that it costs four times the amount of a fine to issue it? We are hemorrhaging money to enforce fares and to what effect? Before the regular, RapidRide enforcement, what was the estimated fare evasion rate? What is the fare evasion rate after regular enforcement? I don’t recall it being complete lawlessness prior to regular enforcement, so what benefit can we show fare enforcement is providing? Fare evasion on Link and RapidRide is around 3%. It’s less than the cost of turnstyles. Remember that the lost revenue is not 100%. First, because fares cover only a quarter of expenses, so a lost fare is only a 25% loss rather than a 100% loss. Second, you can’t assume that everybody who didn’t pay, would have ever paid. Some people flat-out can’t afford it, and others would not have taken the bus if payment was inevitable. So you can’t count those as revenue losses because the revenue never would have been there under any circumstance. The record companies are notorious for making this argument. They say that 100,000 “pirated” albums (not really pirated, but copyright-infringed) equals a loss of $15 per album, or $1.5 million total. They claim that’s why the government should impose large felony fines, and they take the entire amount as a tax loss (I assume). But in reality many of those people would not have bought the album if they couldn’t get it for free, so it’s dishonest to call it a revenue loss, because the revenue would never have been there under any circumstance. It’s a phantom revenue. Let me explain folks – without fare enforcement, not enough folks will pay their fair share. Consider a transit fare like the gas tax – doesn’t cover all the costs, but is a contribution to our system. The $$ to replace it has to come from somewhere. Has this director done a day of fare enforcement in his life? Surely, he must have encountered the dilemna of issuing a warning or fine to someone who had clear and obvious proof of payment (valid ORCA pass or valid ORCA transfer). Is he the one bottling up any effort to collect data on mis-taps and adjust revenue share accordingly instead of trying to scare away ST’s best customers? Last I checked, ST still doesn’t even collect data on missed taps for ORCA cards that bear clear and obvious proof of payment. Perhaps it is time auditors went out with the fare enforcement patrol to get a reality check, as was done with Metro. Those auditors could also scan the trains to get a better idea about the demographics of who rides the train, since, presumably, the transit-riding population will be less white than the general population. But the only way to get that data is to collect it. BTW, the applicable state law does not contemplate the possibility someone will accidentally tap out instead of tap in before boarding a train. I don’t think ST has any legal grounds to issue fines for mis-tapping. Sure, fixing the tones to be distinct should significantly reduce incidents (eventually, when the pod gets around to it after ten years or so), but that doesn’t then make it legal to issue fines for mis-tapping. I also am appalled by this statement. This sort of willful ignorance of reality for their own convenience is the exactly the sort of thing that turns people against bureaucracies and against governments in general (and, one would hope, against the public officials whose job is to supervise those bureaucracies but cannot be bothered to do so). There’s a good chance that, in the time it has taken me to write this, some FEO, apparently following the instructions of the speaker, has harassed or tried to fine someone who HAS paid the fare. FWIW, I have NOT been either warned or cited for fare evasion while holding a valid pass or valid ORCA transfer. I do know people who have been. They would just say that the card’s validity ended when you tapped out, so after that it’s like an expired paper transfer. Somewhat unrelated: I will miss having Rob Johnson on the ST Board, and on the City Council. x1000. I was going to give him most or all of my democracy vouchers. Yes. Who’s going to be the best person on the board now, and how good will our Seattle delegation be. And who can fill Rob’s shoes? I have been impressed with Claudia Balducci, although i don’t think she’s in Rob’s league. I’d call her second though. Is she still on the ST board? We should be giving absolutely no business to Securitas. They have a LONG history of being the elite’s private force in class warfare, formerly known in America as the Pinkertons. Nothing has changed. Securitas is following the orders given by ST, as far as I can tell. I don’t think the problem is Securitas necessarily. I think the problem is the orders from ST.
Notice, also, that the fatal encounters cited are at the hands of directly-hired law enforcement officers. Nor is Securitas in the survey data collection business, which is an essential step to know whether fare enforcement is getting racially disproportionate outcomes. “Glaser insists that racial bias was the reason for the incident.” I’d like more on why Mr. Glaser says that. I see nothing in this article that proves any bias. When I’ve been checked the officers did exactly what was described in the article…start at each end of the car and check everyone. Any time people assume race is involved, it’s more likely than not that it isn’t involved. If they were two white kids, this “gentleman” wouldn’t have suspected anything, much less reported it. Is it really that hard to believe systemic racism exists in America? Black people are 700% more likely to be exonerated by the Innocence Project (and others). 50% more likely to be stopped for “no reason” while driving, 250% more likely to be searched without consent (whites 30% more likely to have contraband), 50% more likely to be arrested vs warned, 15% more likely to be offered a plea deal with prison time (vs community service time served etc), 20% more likely to be convicted, and serve 10% longer sentences. All studies behind these #’s control for what you’d expect- geography income priors circumstances of arrest specific charges etc. Fun fact- if you multiply out all those factors from stopped on the street to convicted, it ends up being roughly 675% (1.5 * 2.5 * 1.5 * 1.2) more likely that a random black person (vs white person) goes from legally driving their car to prison. Eerily close to that 700% more likely to be exonerated. I have plenty more sources to back up those stats if you want. @barman. Back to the topic, the article is on ST fares and ticketing for those without proof of payment. They have statistics for those who are getting ticketed, and a certain amount are given to African-Americans. The assumption being made is that is too high. Everyone gets checked when fare enforcement goes down the line. I’ve never seen it done any other way, one person to the next, without selection. The statistic of quantity of tickets towards a certain group in an of itself cannot, and should not, be used to determine that there is bias. Unfortunately, that’s as far as many people get, which requires no critical thinking. Looking strictly at quantities, when there is no randomness in who gets checked, you cannot determine bias. Any time people talk about racism, there will be others that deny that it exists. This occurs even when faced with solid statistical evidence. You can see by the *very first example here*, how the stated policy allows for discretion (and discrimination) by the officers. The fare inspectors arrive and announce they are going to check everyone. A handful of people head for the exits. Are they “hopping”, or is this really their stop? Do the officers follow them, and ask for fare on the platform, or continue checking the rest of the group? Either one is an appropriate response, and if officers really think “They could tell you” which riders don’t have fare, it is reasonable to assume there is some bias involved. That doesn’t necessarily mean racial bias, but it is a reasonable assumption, given the statistical evidence here, as well in other forms of law enforcement (such as that barman referenced). There is an issue where lines which get fewer riders, or have greater compliance, are checked less frequently because the number of hits are less. Fare enforcement is never truly random, if only for efficiency. I doubt there’s significant fare enforcement between Angle Lake and Sea-Tac, for instance, or on outer portions of a Rapid Ride line. The enforcement is going to be more in the center. TIBS is my closest Link station, and I’ve never seen FEOs around there and only twice on the F Line in the space of 3 years using them. Yes, I don’t really care what a rando thinks. Facts are what matter. barman, I think worsening habit of using employees of profit-making corporations for anything close to policing needs to stop happening in the United States of America. Period. Our forebears were as fond of Hessians as the Irish were of the Black and Tans. And some other civilian populations, Blackwater. But from what I’ve seen of Securitas officers in Sweden and Finland as well as here in Seattle, passenger-relations would improve a lot the day they’re sworn in as Transit Police. And they and I also share same opinion of a policy that makes me a “Fare Evader” for tapping my paid-up monthly ORCA pass “On”, as the rules are posted to mandate, after failing to tap “off”. Whose severity is nowhere mentioned systemwide. Given the kind of city Seattle has turned into, not sure this one is racially motivated. High prices for exhausted underpaid work look pretty much colorblind. Except that since there’s no adjustment for income, it’s extremely likely that people with about my income or a little less, carry points against their criminal records, for lack of the money the policy’s authors shake out of their pants-pockets every night with the rest of the lint. Could use some advice as to sources for my own rabid little fanged grievance of a contribution. Any info or advice as to stats on fine collection, appreciated next open thread. Though numbers aren’t really the point. One penny from one falsely-punished passenger is extortion. And the System’s present immovable defense of the policy- Grand theft Automobile Alternative. Could we say, for their own good as well as their passengers’, that the inspectors could’ve handled like this? Let the boys go, and note over the radio the problem and description. And any inspectors seeing the boys, call them aside off-train, apologize for scaring them, and talk with them awhile abut what it’s like to have an inspector’s job, and how to help them. With information how soon, given their apparent ages, there’ll be a valuable public service job available. That doesn’t require forty years and a trillion dollars worth of debt to be trained for. Barring the first, each of the examples looked bad initially but upon a closer, sober inspection the FEO’s were acting appropriately and protecting the public. The first example sounds like bias and it was treated as such, good. The FEO’s received additional training (well one quit – good riddance!) The other two incidents describe an FEO putting themselves in harm’s way to protect the public and being maligned in the press because of a skin pigment discrepancy. I have witnessed dozens of fare enforcement checks. Every single time they start at opposite ends of the cars and check every single person, in order, from ends to middle. Nine times out of ten they leave plenty of opportunity for a fare evader to make a quick exit at the next stop before they finish checking anyway. This standard procedure could not be less biased. In the one example of a departure from S.O.P. the matter was treated seriously and handled appropriately with the FEO’s being disciplined and receiving additional training. Most people that can pay the fare, do. The poorest are the most likely to evade the fare out of necessity. The unfortunate truth is that opportunity is not equally shared in this country and on average, African American households in Seattle make less than half that of white households. It stands to reason that this group would be more like to try to evade a fare and to subsequently be caught and cited at a higher rate during a check. This is evidence, and a result of, bias in society at large rather than a biased ST policy or FEO behavior. Nine times out of ten they leave plenty of opportunity for a fare evader to make a quick exit at the next stop before they finish checking anyway. And that is where the discrimination can occur. As stated, the official policy does not involve blocking an exit, but following someone suspected of being a “hopper”. They can follow someone out the door and ask for fare on the platform, or they can continue inspecting inside. That is a reasonable policy, but it means that *not everyone is checked*. It means that the officers have discretion. Again, that is a good thing, but it opens up the possibility of discrimination. Right, both of us and ST agree that FEO’s shouldn’t be stopping people from leaving when the doors open or using their discretion to decide who gets checked. That’s why it was appropriate for ST to discipline and retrain the two employees who weren’t following policy. The takeaway is that ST seems to take this issue seriously. I also wonder what the stats would look like if we eliminated these outliers skewing the sample. Like if that one guy who gets a ticket every other week happened to be disabled do you think we’d be discussing why in the world ST is discriminating particularly against the disabled? If we truly stopped fare enforcement entirely many would stop paying. I know I would. I don’t have a ton of extra money laying around. No way I am paying if I don’t have to and others don’t bother. I also never pay use tax when I buy something in Oregon. Total scofflaw. Fare enforcement should be as infrequent and hassle-free as possible. It shouldn’t be eliminated entirely (well actually the fares and the fare enforcement should both be eliminated but if we have one we need the other.) So basically the system we have now. Sorry everybody. Got to trade in my laptop for a 1926 Remington that looks like an grand-classic slot machine, with that keys that cause more broken fingers than carpal, And suitable Don Martin Glossary sound effects like tikitytikitytikity Ka-CHING! You’re all doing great. I’m out of here! When 2 kids jump up and run away from Transit Police that’s called “acting guilty”. But for Oscar quality guilt impersonation, remember ten years ago when our whole mortgage banking industry couldn’t have looked guiltier if they all arrived in court dressed like Snidely Whiplash. Or had railroad police catch them in the act of tying a willowy blonde in a filmy white gown to the tracks, who when his wig fell off turned out to be CEO of Washington Mutual. So in this case, better to act like your favorite cop on Netflix- I like the psychotic former coal-country Marshall in “Justified”- and act like its no skin off your squad-car cushion. While you use your very accurate video tools to locate the train they’re on right now. And in a friendly off-train discussion, explain how next time they mess with you, they’ll spend ninety days being fare inspectors themselves. When you walk them on board and introduce them as your new buddies. In front of all their old ones. How do you think I got to be a driver? I think that part of the confusion about “blocking” is related to what the officers are preventing. If there was suspected theft, blocking is ok. If there was suspected fare evasion, blocking is not ok. Frankly, I think that enforcement should be led by a properly trained and vetted law enforcement officer. Untrained people should never be in a position of authority. I’m cool if an officer has a helper or two, but at least one FEO should be more professionally recognized. After all, untrained FEO’s are not authorized to explore issues of theft or dangerous behavior.—and such protection from the public is needed. Everyone hates fare-gates on here but they do make this type of situation much less common. Yes, people will jump over the gates, but that’s a pretty willful act. Not like accidentally tapping wrong or losing your ticket. Not everyone. Gates are my preference. I grew up with them in NY and have gone thru countless such gates using various transit systems all over the world. Fare gates work but everywhere I have been that has them the stations are staffed. Look at the staffing you wind up with at Coleman Dock. Glenn, a passenger lifetime that started in Chicago on Peter Witt streetcars tells me that your worst worry about the staffing which mechanical fare collection requires is the best thing about them. Same for conductors. Because the turnstiles and similar instruments were secondary. What guaranteed revenue and kept order were knowledge-workers in pressed brass buttoned uniforms, giving information gained from experience and rigorous training. Thereby saving the system a fortune in operating time, while just by their demeanor indicating that the system was in dozens of sets of good hands. But also, while nobody thought these people were police officers, they carried themselves so as to put them, in the public’s eye, a similar force for order. Put a hundred children of first-time passenger years in a room full off machinery they can operate- especially if its got a lot of copper and brass on the moving parts- and also computers doing similar work. Los Angeles’s gated subway and light rail stations are all unstaffed. There’s a video intercom by the gates if people need assistance. But the design of the accessible gate is so laughbly bad you could slip through with little effort and people will open the emergency gate, which isn’t locked or alarmed, to let people through. I wish they had fare gates. I’m pro-gate as well – at the very least “barriers” with adjacent card readers (as at Sea-Tac) – to act as a very obvious reminder to tap on and tap off. Many Link stations have card readers off to the side, tucked around a corner, etc. which seems counter-productive. Readers should be at the point of entrance to the fare-paid zones and should act as virtual fare gates if actual gates aren’t provided. Fare enforcement can then be at least partially moved to the platforms (or mezzanines) themselves rather than the train – doing so would provide station staffing to some extent (and I don’t think that’s always needed any more than it is today). Spot checks can still be made on trains if necessary, but doing it at the station means 1) there is staff there; and 2) acts of fare evasion – which by definition gate-jumping is – are rightfully seen as willful and taken care of right there. Once buses are out of the tunnel the entire system at the platform level becomes a fare-paid zone and can be treated accordingly. The only overt racial bias round here is the tired use of “colored people” as leverage in pathetic attempts to justify the existence and expansion of mass transit. If any of the writers on this blog, guest or otherwise, were truly concerned about the effects of historic racism in the USA, they would be promoting the usage of SOVs to provide the transportation flexibility needed to effectively compete in our job market. You know, just like more privileged people have been doing for almost 100 years now. Gregg, what racial, political, or economic group of people want to spend their days stuck among freedom-giving cars whose only moving machinery is the air conditioner? And the people whose cars can move the least work the most. If I had about three seconds to waste, I’d ask you for some examples of your every word. But one good historical reference. Regardless of skin color or income, to escape to freedom you’re going to have to walk. In no way was I advocating that every person to drive a car to work. My point was about the absurdity and actual racism of using silly stories of alleged racism to promote a mass-transit agenda. Either way, the preferred method of transportation is up for each individual to decide for themselves and nobody else. It’s pretty easy to demonstrate just how many people want to be “stuck” in a car with their air-conditioning. Just look at any of the WSDOT traffic cameras aimed towards a freeway during commute times and the data will be clear. If everybody were to get into an SOV simultaneously, they would not be able to fit on the roads. SOVs don’t scale to large cities, including pushing things apart for their roads and parking which makes it too long to walk so they have to drive more. Half of American cities’ land is devoted to streets and parking, and the parking is subsidized by everybody except the driver who’s using it. A city should have a comprehensive mass transit system, period. The US doesn’t because we threw it away in the 1940s; and the oil companies, car companies, and automobile lobby ran a massive campaign saying cars would solve everything and ignoring the problems of scale and car dependence. Gas was 20c a gallon then and they thought it would remain that way forever. Transit and cars aren’t a zero-sum game. Transit is a basic city service that should be fully impmemented to the scale matching people’s desired trips. Automobile infrastructure is an extra beyond that. Some of it is essential for emergency vehicles, disabled people who can’t walk to a bus stop, working trucks, people transporting heavy things, and some extra for moderate choice trips. But we can’t build enough for everybody to drive everywhere all the time, it’s impossible, and it destroys our cities. And it’s unjust and cruel to force people who can barely afford it to spend thousands of dollars a year on a car because there’s no other option. Transit is the other option that should always be available, and cars should be an optional extra. If everybody were to get into a light rail car simultaneously, they would not be able to fit in the cars. Light Rail does not scale. Light Rail is much too expensive and does not go to places people want to go, live, or work. Seattle and Sound Transit is a perfect example. If everybody were to get into a light rail car simultaneously, they would not be able to fit in the cars. If that were to happen, we would have a legislature that would be more willing to provide funding to vastly expand Link at a much quicker rate. You know, what happens currently with freeways. Light Rail does not scale. Freeways don’t scale either, but we can’t seem to stop building or expanding them. Also, go to NYC, London or Tokyo (or any other large European or Asian City) and rethink your statement. Once your infrastructure is in place, adding additional trains or cars is the cheapest form of capacity around. Mass transit can move way more people than SOV cars can. We recently spent billions to add a single lane to I-405 on the Eastside in the last 10 years, with another $1.3 billion slated for additional expansion. We’re almost done spending nearly $2 billion to expand I-5 in Tacoma. In January, a tunnel under downtown Seattle will open to the tune of $3.3 billion. SR-520 still has 6 years to be fully complete; we’ve already spent $4.5 billion, but still need to fund the remaining approach, Montlake overpass, Portage Bay bridge and second Montlake drawbridge, probably to the tune of $2-3 billion more. We’ve earmarked almost $2 billion to complete SR-509 and SR-167. So nearly $20 billion later, those projects have done nothing to reduce or mitigate traffic. $20 billion could have built A LOT of light rail that could actually move people. …and does not go to places people want to go, live, or work. It goes to downtown Seattle, which is where the vast majority of the greater region work. It will soon go to Bellevue and Redmond, where the next largest amount of people work. It goes to Capital Hill, one of the densest neighborhoods in the state and a popular destination for food and fun. It goes to the airport and will soon go to Northgate. Eventually, it will go to Everett, Tacoma, Lynnwood, Federal Way, Ballard, West Seattle and many other neighborhoods. It could go there quicker if we had the political willpower. Don’t confuse a non-comprehensive or unbalanced plan or political unwillingness to spend more on transit with inherent limitations of light rail. A comprehensive train and bus network does scale, as many European and Asian cities prove. Light rail can meet the needs of medium-sized cities like Seattle. There’s a debate over whether the downtown-UDistrict-Northgate-Lynnwood segment might be near the capacity ceiling and should have been heavy rail, but Link is not the highest-possible capacity either. Other light rails can go 65 mph or maybe even 85, and have open gangways so people can stand right at the ends of inner cars, but ST chose a combination of specs that favor other factors and limit it to 55 mph and have unused cab ends in the middle of trains. Current networks are designed assuming that 40%-80% of the population will drive, but before cars became affordable the streetcar/interurban networks were designed for 95% of the population to use. Of course Link is not a complete solution and never could be even with a more effective design and political climate (like Vancouver, Toronto, Calgary, etc) — especially with Pugetopolis’s vast seas of low-density houses and cul-de-sacs and scattered job sites — but that’s what buses and P&Rs are for, and last-mile solutions like Metro’s shared-taxi experiment in Eastlake (costing a transit fare rather than a taxi fare) and private cars to fill the gaps. And Europe shows that if the cities were designed for transit and walkability from the get-go, transit scales just fine for all the factors of life. It’s the design of the cities that’s the problem here, not transit itself. And since we can’t add more SOV capacity (and doing so only makes things worse anyways), improving transit capacity and speed is our only option. Or parallel lines. The St Petersburg metro has two lines forming a vertical X (and other lines), so there are two lines going north of the center and two going south. They presumably did that to address capacity limitations of the first line, and to serve areas east and west of it directly. So if downtown-UDistrict-Northgate Link approached capacity we could build a parallel line around Aurora and it would divert at least a third of the people, while also serving more people who weren’t previously and putting more neighborhoods within access of the rapid-transit network. The problem is that these lines take 10-15 years to approve and build (especially if they have tunnels), so you have to predict 15 years ahead when you’ll need them. Otherwise you’ll get into a situation like the DC Metro where the center is at capacity and can’t be expanded: adding another line would increase pressure on the bottleneck center, so you need to do something even more radical like a second hub or RER (commuter rail) network. But Mike, you say, we could extend the downtown-Ballard line to Northgate and that would be enough of a parallel line that you wouldn’t need an Aurora line, right? Partly. The further away a parallel line is, the less it diverts people from the first line and the more it serves a different transit market. A station at 85th & Greenwood would likely divert some people living in north Greenlake who could use either line, but a station at 45th & Market would not likely attract diverters from Wallingford or Latona because it’s further away; instead it would attract Ballardites who wouldn’t take Link if the Ballard line weren’t there. But in the particular case of a line that started at Northgate (or north Aurora or Lynnwood) and went southwest to Greenwood, Ballard, and downtown, it would probably do something between between these alternatives. Because typical parallel lines get further apart as they go out, or they remain the same distance apart. But a downtown-Ballard-north line would go apart and then come closer together or meet, so it would be more responsive to some trips and less responsive to others.From Shoreline it wouldn’t make much difference which line you took to downtown, but you wouldn’t take the Ballard line to the U-District, whereas you would take it to Ballard. If the lines cross at Northgate, it even forms a ring almost, facilitating east-west trips across Northgate. I wasn’t suggesting that every person in Seattle drive a car to work, just every black person. Most Seattle neighborhoods would barely notice the difference and only have to deal with 1-2 additional cars on the road during commute hours. Greg, transportation mode is decidedly *not* a choice for most of those drivers crawling up I-5 and 405 every day. It’s not a simple choice between black and white. When transit is non-existent or so limited as to not be a viable option, people will drive because they still have to get to work and live their lives. But this is really a *non-choice*. You might say, people can just live where there is good transit if they don’t want to drive. But obviously, for most people, especially in a major city like Seattle, the decision of where to live is more determined by economics than it is about some notion of “transportation choice.” Because transit is so limited, being able to *choose* to live in a situation to use it is a luxury few have, it is not a decision most people actually have to make and choose to opt against. Of course, some people do just prefer a car for every trip no matter how bad traffic is, and some people do have family considerations that make driving the most practical option for that part of their lives, but in the end most people just don’t have a damn choice. It’s pretty clear that Gregg is arguing in transparently bad faith so it’s probably best to stop feeding the troll, guys. I don’t think my eyes have ever rolled this hard. 1, The headline is like saying Nordstrom store security brings the police into shopping. But, at least on transit, the police never have to be involved. It’s up to the rider whether they are called or not. The first infraction from FEO’s is a warning, and the rest are fines that nobody pays, and charges the prosecutor drops. The only time the police are called is if the rider refuses to show ID, or if they don’t have ID, refuses to give their name. I forgot the other four points. Women spend more money than men on transportation each month, according to a new study, primarily because they don’t feel safe on public transit. And I can tell you that women who aren’t cis white and abled trust FEOs and law enforcement about as far as we can throw them, especially since the overwhelming majority are men. I personally feel far less safe around men with nightsticks and tasers than my fellow passengers. I have never heard that disabled people are afraid of FEOs too. That’s a new one. Have they been harassing the disabled too? Is there an example of this? Keep in mind disabled does not solely mean visibly (ie physically) disabled. I’m autistic, and I’m 90% sure they ticketed me several months ago because they read my anxiety and issues communicating as evasiveness and standoffishness. If I’d been in a worse state, it could’ve easily gone worse. And I’m white so I get a fair bit of the benefit of the doubt, disabled PoC have it a thousand times worse. I’ve seen them beeline right for them. Perhaps an additional factor is safety concerns on public transit. It’s safety concerns period. Transit isn’t special in that. When will you ban Mark Dublin for his constant barrage of irrelevant, long-winded, off-topic diatribes?